I watched the latest episode of Samurai Jack season 5 episode 7 and i was absolutely amazed. The whole show became completely dark, violent, and grim on a level never before seen. With that in mind, i will give my thoughts and analysis on this episode including spoilers. The beginning of the episode is set in the days of his younger self when he is searching for a time portal. He is greeted by several small creatures and they guide the way. He seems to have almost given up hope of ever returning to his time..that is until he abruptly finds a time portal. Jack quickly makes a run for it. 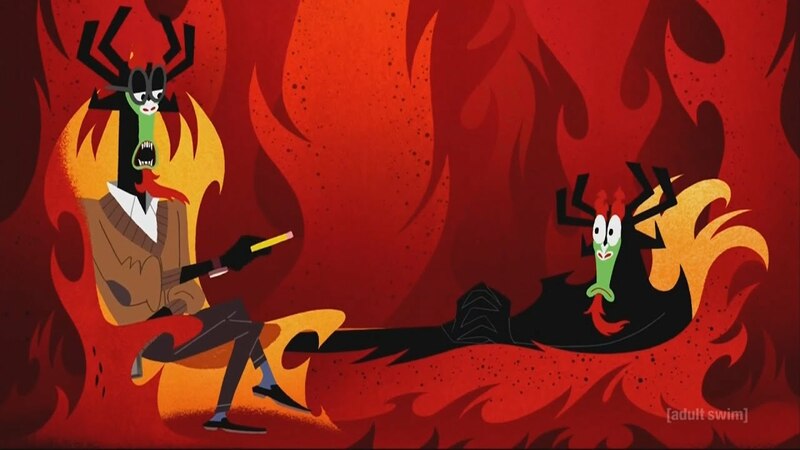 He jumps in but just as he is traveling back in time, Aku grabs him and pulls him back. 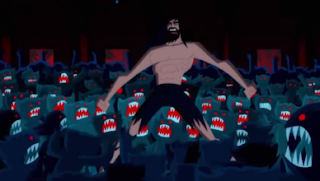 It would seem that Jack and Aku would once again engage in battle but Jack impatiently runs for the portal. 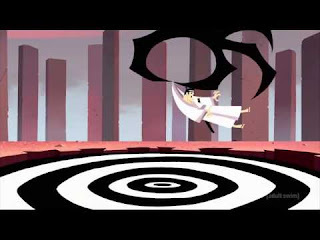 This time Aku destroys it and tells Jack it was the last time portal in existence. At that moment, Jack loses his self control and is consumed by anger. In a fit of anger, he rushes towards Aku and attacks him. Aku evades him, wisely knowing that he cannot defeat Jack as long as he wields the sword. Aku transforms the small ram creatures into monsters to fight him. Jack takes out all of his anger on them until they all die. In a guilt-stricken and nervous state, he drops his sword. Jack is stunned by the realization of what he had done but the sword lands near a hole and it falls in. The scene flash-forwards to Jack recounting his tale to Ashi. As they approach the site where Jack lost his sword, they find that it's gone. 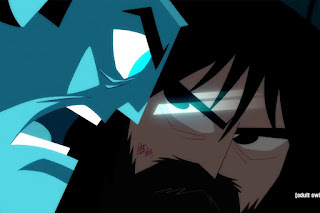 Ashi quickly suspects that someone has stolen it but Jack realizes that the sword has left him. 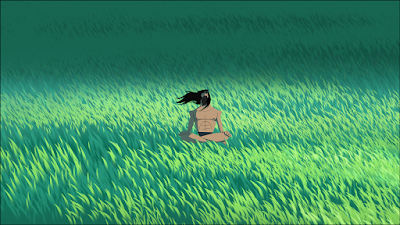 Jack then goes on a spiritual mission to restore his sword as he sits in meditation as Ashi guards him. Jack appears in the center of the universe as if he reached a state of nirvana only to embark on a raft in the sea. Ashi notices an entire army marching towards Jack and is surprised. Nevertheless, she confronts them and tells them that she will stop them all. They then engage in a fierce and brutal battle. It is in this very moment that Ashi's loyalty, character, and faith in Jack is tested. Jack slowly reaches a house with a man resembling Buddha stands on the dock. The man asks him to join him for a cup of tea. This is very important as tea in Japanese culture has a strong spiritual connection with Zen Buddhism. The tea ceremony symbolized honor, clarity, transcendence, and a spiritual awakening to the Samurai. It's clear that Jack must be spiritually refined in this test before he can recover his sword. 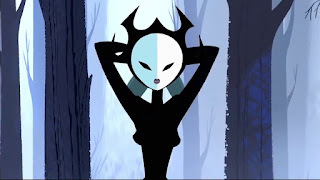 Meanwhile, Ashi has killed almost all of the soldiers. She quickly realizes too late that there is all but one left alive and has already rushed to Jack. Ashi quickly runs on foot then calls the bird to her. Ashi barely stops the arrow flying towards Jack. It's revealed that the warrior attempting to kill Jack is none other than her mother. This is probably the biggest test that Ashi has ever faced and whether or not she really has changed for the greater good. Her mother explains to her that she was always the weak one and gives her one last chance to redeem herself by killing Jack. 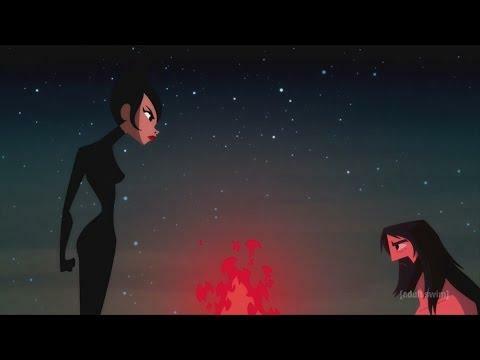 Ashi refuses and explains that her mother lied to her about everything. Ashi's mother realizing that Ashi clearly has taken Jack's side, fights against her. 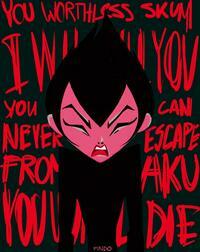 The high priestess then tells Ashi that Jack killed her sisters to which Ashi replies with "you killed them! We were made for one purpose - to kill! Our fate was sealed the day we were born!" 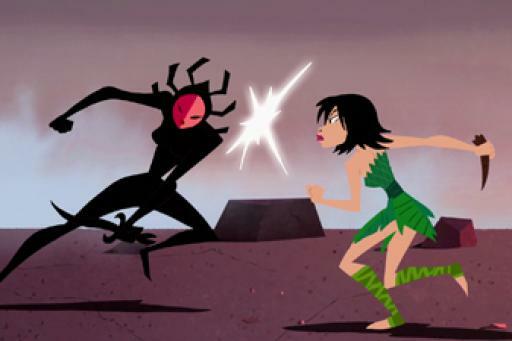 The battle culminates to a point where Ashi kills her own mother. In Jack's spiritual quest, the monk says that all the ingredients in the tea are good but it lacks the most important quality - balance. Jack is frustrated and angered by his response. Jack desperately pleads for the monk to show him the way to his sword but the monk refuses. The monk explains that it's not for him to show Jack his own path. Immediately we see Jack's manifestation of his inner anger rant about the monk hiding the way. As the monk explains the path to the sword is something Jack must earn, Jack's inner anger tells him that he deserves it after everything that has happened. Eventually Jack realizes that the ultimate obstacle in his quest to the past was himself. Since the time he was transported to the future in the first episode to the present, Jack has built up alot of anger and frustrations. It's his inner uncontrollable anger that has blinded him. Interesting to note that one of Jack's greatest flaws is anger. If you recall in the episode "Jack vs. Mad Jack" episode, Jack has conquered his angry side before but it seems to have reappeared later in the show. Jack vanquishes his suppressed rage once and for all. The monk finally sees that Jack is completely in harmony with himself and we see the gods from the "birth of evil" episode appear to him. At long last, Jack is worthy of wielding his sword and undergoes a transformation to his younger self. While i enjoyed this scene, i disliked Jack going back his younger self because it's not consistent with the story. The episode concludes with Jack returning to the present world and tells Ashi that the next step in their journey is to fight Aku. These are my concluding thoughts regarding this episode. 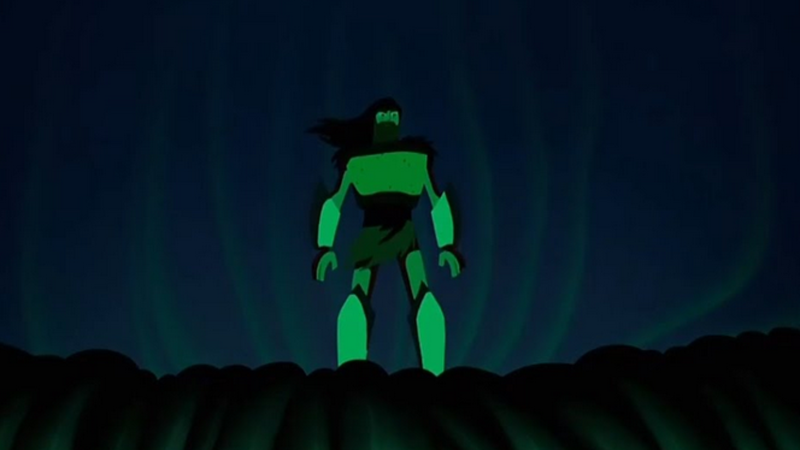 I predict in the next episode that Jack and Ashi will face Aku but will not be able to defeat him. Let me know your thoughts and predictions in the comments below as i eagerly await the release of the next episode. I was completely in shock and awe of this episode because of all the things happening so far. The episode took a completely dark turn since the last one on a psychological level as i shall explain shortly. In the beginning, we see the Scotsman and his army including his daughters rallying against Aku. 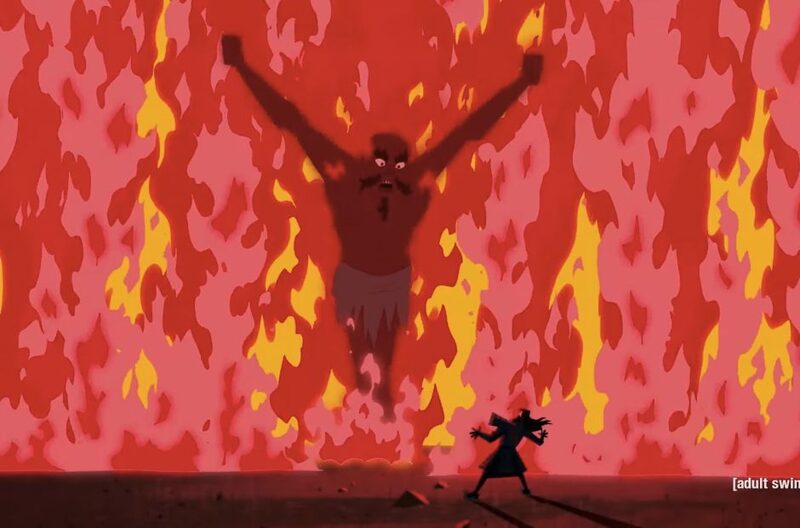 The Scotsman has clearly aged and intends on attacking Aku in his own domain. 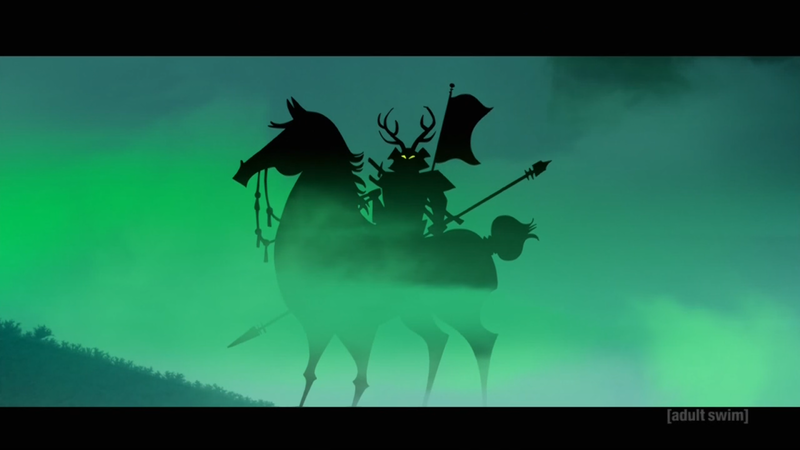 Aku comes out of his lair and the Scotsman realizes he needs to stall Aku to allow his army to flee. Aku realizes that he may as well annihilate them all. The Scotsman distracts Aku with words until he mentions Jack and Aku kills him. His daughters vow to avenge him only to find his soul appear due to Celtic magic. His plan is to guide him and call for Jack's help. 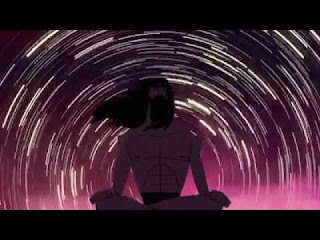 Ashi finds that Jack has disappeared and thinks that he deserted her. She realizes that Jack is on a sea creature and rides onto dry land. He then says "good bye" and leaves. She's not satisfied and demands that he tells her the truth about Aku, reverting back to her old hateful ways. Jack is reluctant seeing that she hasn't changed until Ashi begins to doubt him and leaves. Jack then agrees to show her but only until morning. As to why he does this, i think he did it to test her out. There's no point in trying to show her if she refuses the truth. She could've kept attacking him at that point but leaves instead. Jack then realizes that there's a chance she might change so he agrees to show her the truth. In the night, she hallucinates of her mother demanding that she kill Jack and insulting her in the process. Ashi refuses to listen stating that Jack saved her life. They go through several lands where Aku's corruption seeps through the land and destroys mother nature. Ashi begins to slowly realize that Jack was right all along. As they come into his city, they find a bounty hunter who intends on exterminating an entire village for selfish reasons. 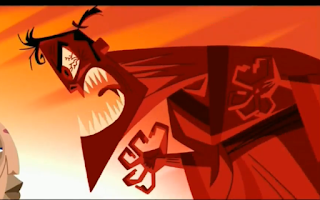 Ashi finally has enough and asks Jack what their next course of action is to defeat Aku. Perhaps the most shocking answer that Jack gave was nothing. He explains that he's been fighting Aku for centuries and has seen countless people die. Since he's lost his sword, he's been devastated and in despair. He doesn't want to win but doesn't want to lose either. He simply wants to exist in a never-ending stalemate. Both Ashi and Jack find that the children of the blue creatures were taken to a factory. They go to rescue them only to find that they've been mind-controlled by an unknown enemy. 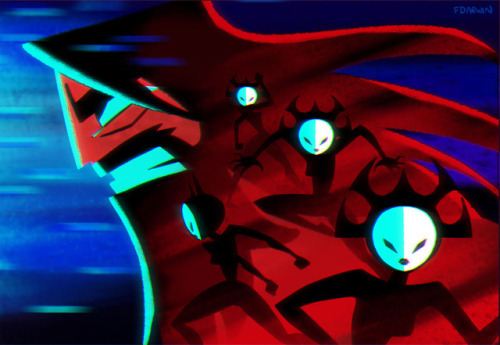 They fight them off as Ashi searches for the mastermind. Ashi is captured and tortured by the man in the factory. Ashi succumbs to the pain and helplessness until he says "Would you look at that. Righteous fool. After everything, he still can't hurt an innocent. Turning those little brats into weapons pretty ingenious, right? Children are foolish little things, easily manipulated. Surgically implant a chip in their neck, and the right audio frequency does the rest..." That's when she becomes enraged because she realizes she was lied to and manipulated the same way as a child by the high priestess. She uses that hate and rage to endure the pain then frees herself as she defeats him. Jack suddenly finds the children fall unconscious and assumes they are dead. Jack loses his mind and despairs until he sees a vision of the mysterious samurai who says "it is time!" Jack agrees and follows him. Why does he do this? He realizes that he can no longer to take losing more innocents. As long as Aku is alive, the world will continue to be destroyed. Jack follows the samurai as they both are seen leaving. This is one of the reasons why i believe the samurai in the mist is none other than Jack's ideal self. What are my predictions for the next episode? Jack is going to find his sword but before that, he's going to do alot of soul-searching to find his purpose and purify himself of past failures. He has to see himself worthy of holding his sword again and not be so self-centered as he has become. As for Ashi, she may also have to find her purpose in the world after realizing that Jack is not her enemy. In conclusion, i'd love to hear your thoughts on this episode and the next one. 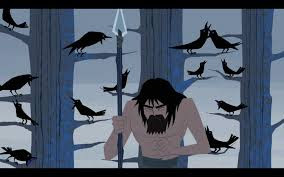 The previous episode concluded with Jack falling from a broken tree along with Ashi and the other daughters of Aku. This week's episode wasn't quite what i expected but the light humorous tone and exploration of Ashi's character as i'll discuss. Spoilers included. 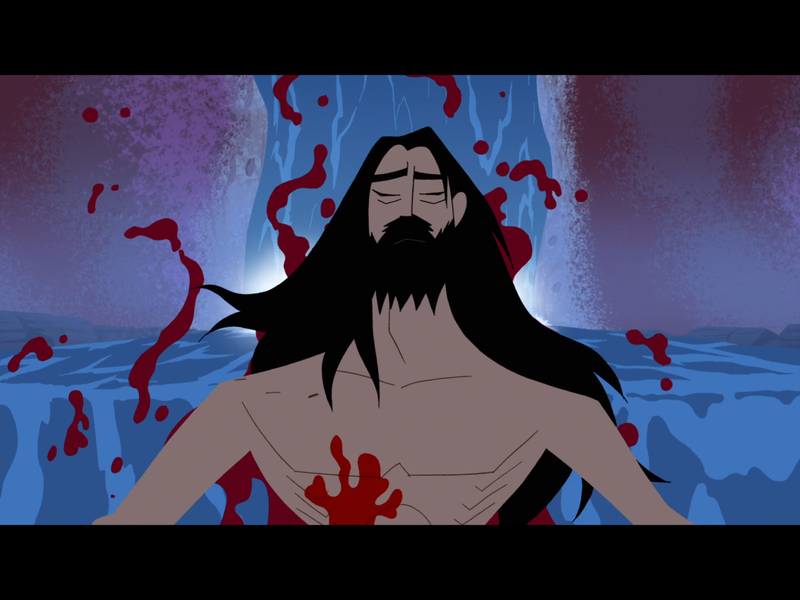 The episode begins by Jack surviving the fall and looking at the bloodied body of Ashi, presumed to be dead. Jack once again hallucinates that the crows accuse him of being a murderer. Jack is deeply troubled and says they chose their own fate in defense. 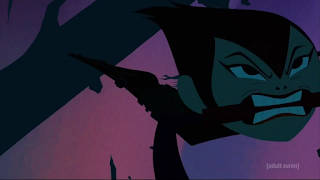 Little does Jack know that Ashi is still alive and she attacks him. He manages to capture her and is surprised by her warped mentality. At that point, he sees a very troubled and misguided soul rather than a real enemy. He chooses to spare her and take her with him as they are attacked by several creatures. Suddenly, they find themselves swallowed by an enormous creature and have to find a way out. From that point on, Jack is constantly having to deal with both the creatures and Ashi. While in the creature, Jack faces more hallucinations. His former self tells him that she should suffer the consequences of her actions. This internal dialogue is very interesting because we get a glimpse into Jack's younger self. We've never seen Jack encounter a situation like the one he currently is facing but if he did, he'd probably show no compassion towards someone like Ashi. It's in this episode that we realize that now that Jack is older, he blames himself for her hateful character. He feels guilt over not vanquishing Aku and is now paying the price of seeing a human brainwashed to Aku's will. Meanwhile, Ashi seems to be stuck in an internal struggle of her own. From what it seems, she feels abandoned. It's like she wants to give up her quest to destroy Jack but is reminded by her "mother" in a dream of her original purpose. 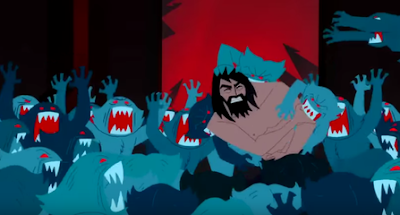 Ashi is captured and Jack saves her from deadly creatures. She's clearly ungrateful and keeps raving about how majestic Aku is. Jack has an outburst and tells her the truth about him. 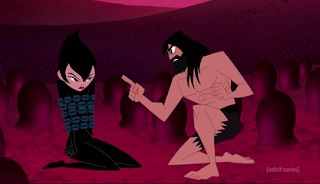 He explains to Ashi that Aku has destroyed mother nature and that is what makes him evil. Ashi refuses to believe it and continues to make Jack suffer even as he struggles to find a way out of the enormous creature. Both come across a group of creatures amazed as Jack says "even in the bowels of the darkest of creatures, there is beautiful light." They struggle to make their way out of a blowhole and eventually land on a piece of land. Ashi manages to free herself with a blade and sneaks up on an unsuspecting Jack. She then has a flashback of when she was a girl, she saw a ladybug and ceased from training. The high priestess took the ladybug and called it a distraction then crushed it in her fingers. Flashforward back to the present, Ashi sees a ladybug land on Jack's finger and he does nothing to it. She slowly drops her weapon and falls down as she succumbs to the truth. Ashi finally realizes that everything that she's learned has been wrong. She was told in episode 1 that Jack was the one who threatened to destroy mother nature but the high priestess killed the ladybug. Ashi slowly learned to value life in a way that she never has before. She realizes that if her whole purpose was to kill then Aku isn't as benevolent as he is made out to be. She has no other choice but to journey with Jack for the time being until they figure out what to do next. In conclusion, these are my thoughts and interpretations of the episode. 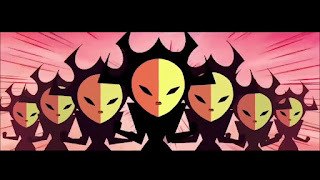 I'd like to hear more about what you thought in the comments below as far as whether or not Ashi is redeemable and what will happen in the future. Just finished watching Samurai Jack season 5 episode 3 which took place after Jack fell into the river and drifted away from the daughters of Aku. This episode was far more darker than the last one as i explain in my review. Once again, spoilers included. This episode begins with Jack drifting away in the river. Jack probably knows that since he's been stabbed and losing blood, he would not have much of a chance to survive if he tried running on foot. He probably would've lost more blood, fainted or tripped, and left footprints which would make him easier to track. Traveling through a river allows him to cover more distance, escape faster, and remain undetected. Jack hallucinates and sees a frog on the log who abruptly says in a human voice "they are coming!" He swims faster only to get demoralized and allow the river to carry him away. Once again we see a vision of the mysterious samurai in the woods. What i loved about this episode is that it deals with the physical but also psychological injuries resulting from Jack's last battle. Many shows neglect that and portray the hero as invincible. Jack has to remove the blade correctly to avoid injuring himself further, stitch the wound up, and conserve his energy. As i predicted in my last review, he has to deal with an internal conflict on what he had to do to survive the fight. He begins to argue with the more sinister persona in his conscience on what he did. The voice begins reminding him that he's dealt with worse things before but that killing a human being was what was bothering him. He reminds Jack that he's being hunted by the daughters of Aku and that maybe he enjoyed killing another human being. Jack denies it all and passes out. He has a flashback of his parents inside a carriage as a child when suddenly we hear swords clashing and Jack's father walks out to face his assassins who killed his guards. He tells them "the decisions you make and the actions that follow are a reflection of who you are.." as he allows them a choice. Jack watches his father kill them all and gets blood on his face. When Jack's father is cleaning the blood off of Jack's face, Jack seems to have the impression that his father is a murderer. His father explains "the decisions you make and the actions that follow are a reflection of who you are...you cannot hide from yourself..."
Later on, Jack hides in the shadows drenched in bloods and finds the white wolf bloodied from the last episode. They both realized they are wounded warriors and nurture each other back to health. From Jack's memories and his relationship with the wolf, he learns that killing one of the daughter's of Aku did not make him a murderer. Jack only killed in self defense and fought for the greater good. The daughters of Aku look over the waterfall while carrying their dead sister and laying her on the ground. From what it seems like, they are stricken with grief and gave her an improper burial. They continue to chase Jack until they come across a pair of deer in the woods showing affection to each other. They have an argument over what these animals are and whether or not they are Aku's minions. From the dialogue, it is evident that they are heavily brainwashed and misguided to think that Jack is the enemy. This will play a huge role in the story as we shall discover later on. Jack then speaks the same words that his father spoke ages ago to the daughters of Aku in hiding. Now the roles have switched. Jack turns from being the hunted to the hunter, no longer confined to his past weaknesses. He gives them a choice to flee. Unlike past robots, the daughters of Aku had free will and they choose to fight Jack. 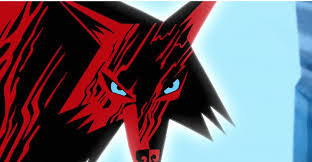 He uses the snowy environment to conceal himself until he attacks and kills some of the daughters of Aku without hesitation. He disarms a few and uses their own weapon against them until finally, he retreats to a tree. I was surprised to see Jack drop his weapon until i realized his true plan. Jack knows that he'll put himself at high risk if he tried going one on one with the daughters of Aku. His mobility and balance would also be compromised. They were highly skilled mainly because they were well coordinated as a team. Jack's strategy was to disarm them and throw them off the tree one by one until Ashi was the last one standing. 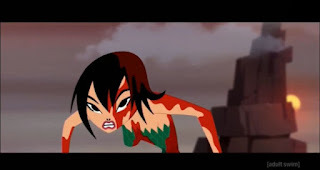 Ashi goes into a fit of rage and begins cursing Jack until he lets go although reluctantly. Suddenly the tree branch breaks off and he falls down the grand height as the episode concludes. What's my prediction for the next episode? Logically, we know that Jack will survive the fall. 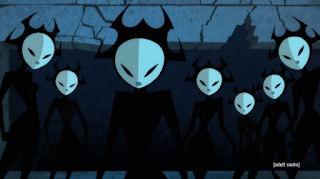 As for the daughters of Aku, one of them (Ashi at least) if not some of them will survive the fall. They will team up briefly to fight against another evil. We will get some backstory of the daughters of Aku and quite possibly, Jack may help them realize that the true enemy is indeed Aku himself. Jack will probably have to find his sword sometime in the future or he will perish. Let me know what you think about episode 3 in the comments below. 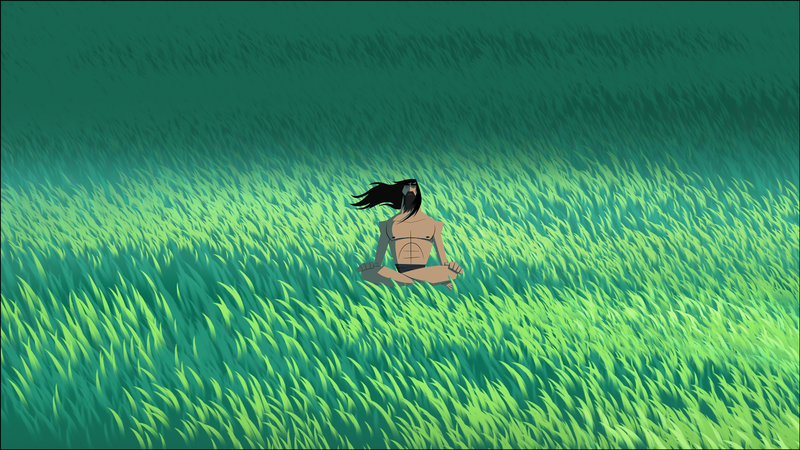 For this week's episode of Samurai Jack, i was incredibly mind blown and found it difficult to breathe. The action, the revelations, everything had me on the edge of my seat. That being said, i continue to give my review and analysis of episode 2. Once again, keep in mind there are spoilers. The show opens up with Aku's minions coming up with ways to destroy Jack but Aku is completely careless. 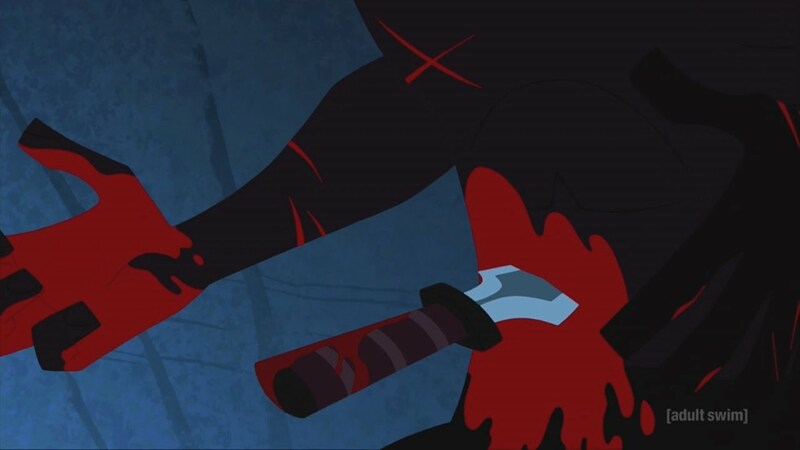 From what we can see, Aku has clearly given up on trying to kill Jack as nothing has ever worked. Aku has become so depressed after 50 years so he has gone into hiding hoping that Jack would die of old age. He then realizes that Jack has not aged due to the effects of the initial time travel. As for the new voice actor who plays him, i think he did a phenomenal job. He captured the essence of the character perfectly much like the original voice actor for Aku. human beings trained to destroy him since birth. Eventually Jack reaches his opportunity to strike and when he does, he strikes down one of his adversaries believing it to be a drone until sees blood. Too late does he realize that he just killed another human being and is overcome with guilt. Jack doesn't hesitate to use his sword taken from his previous battle to create a blockade after getting a knife stuck to his side and falls right into the river. He is taken upstream in an unconscious state. At first i did not understand the purpose behind having the white wolf in the story until i realized it's purpose. The white wolf was meant to symbolize Jack himself fighting against more powerful and formidable enemies. After the fight is over, we see the wolf in critical condition as the episode concludes. I predict that in the next episode, Jack will have some sort of internal conflict within himself after killing a human life and whether or not he should continue surviving. Nonetheless, i am looking forward to how Jack will make his comeback. Let me know your thoughts and comments below. Just watched the season 5 premiere of Samurai Jack episode 1. I absolutely loved how the show had a solid start for it's return on adult swim and had to share my thoughts. I would like to warn you as there are spoilers in this post. 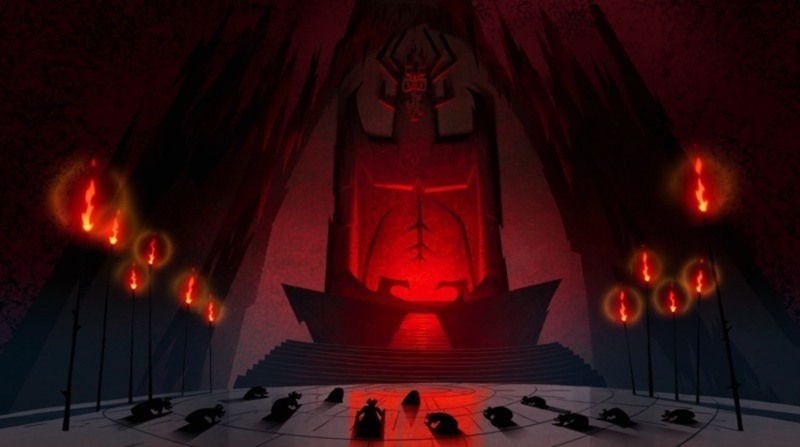 The story is set 50 years in the future when Jack finds himself unaffected by time as Aku's evil continues to spread. The episode opens with Jack rescuing a mother and daughter from several bug robots. Jack returns but not the Jack that we remembered from previous seasons. He now has technologically advanced armor and a bike. He fights using modern weapons such as a gun and staff. Why he's changed so much and how he managed to get all of that equipment is currently unknown. We are then introduced to a new character who appears to be apart of an Aku-worshiping cult. Seven babies are born and placed before a statue of Aku. Immediately, i began to feel uneasy as it felt as if they were about to be sacrificed. I soon learned that they were used for a much sinister purpose. Aku has corrupted the land but corrupting the innocent minds of children takes it to a whole different level. The "daughters of Aku" as they were named were put through abusive and torturous training to become assassins as they learn Aku's evil ways. As Jack approaches a calm river presumably to drink from, he suddenly sees disturbing hallucinations of his parents and people from his homeland. He then sees a vision of an army and the shape of a mysterious samurai in the dark mist. His father continually wails "you have forgotten your ancestors! You have forgotten your purpose! Why son?!? Why did you abandon us?!?" Jack is stricken with fear and driven to the brink of insanity then flees. Later, he tries to justify himself by saying Aku destroyed all the time portals. This is interesting because it gives more insights into who Jack has become. From my perspective, Jack has been searching for a portal back in time until Aku has destroyed each one over and over again. Jack has become demoralized seeing no hope of ever returning to the past. To him, his only last choice is to run away from his quest to save his homeland and live in the future. 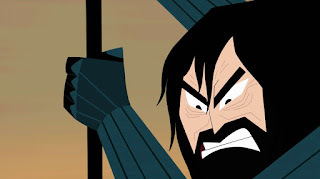 Who is the mysterious samurai that disturbs Jack so much? I interpret it to be himself and whom he is destined to become. 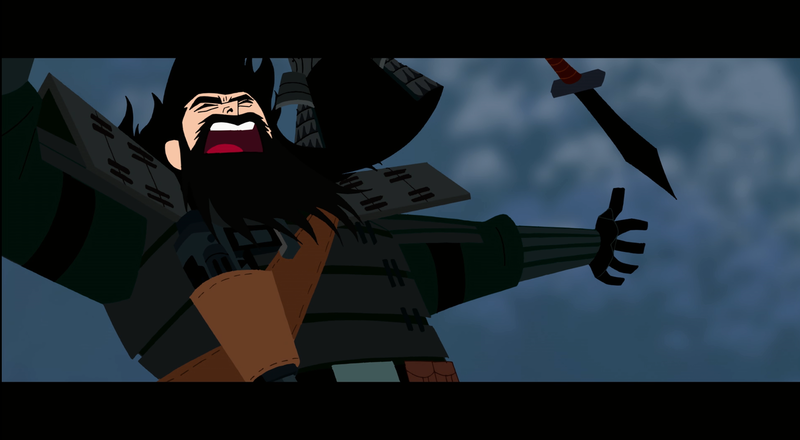 If you recall from "the birth of evil", Jack's father took on the responsibility to defend his homeland from Aku and prepare for battle. His entire purpose is to defend his people and vanquish Aku. Jack is afraid because he knows this is ultimately whom he has to become but lacks confidence. He's afraid and not ready to accept his role. As the story progresses, Jack finds a destroyed village and a robotic musical assassin named Scaramouch. He interrogates Jack on why he doesn't have his sword and we are shown a flashback to where Jack briefly loses it. Now we understand more on Jack's character and why he is more technologically advanced. When he lost his sword for whatever reason, he lost his identity. Now he must fight with more ferocity and skill than he ever did before as his sword was his primary means of protection. Scaramouch uses sound to manipulate objects in an attempt to kill Jack but gets outsmarted not before Jack suffers a hallucination. Scaramouch proves to be a formidable adversary especially when he throws weapon after weapon until the end. Jack retrieves his fallen adversary's blade realizing he will need it later and walks off into the sunset. 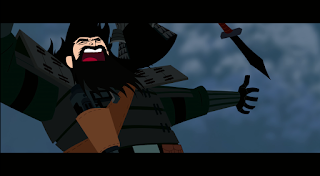 The episode concludes with the daughters of Aku being sent out with one purpose - to kill the Samurai. This is where the premiere ends and the story unfolds with them being some of the main villains Jack will face in season 5. 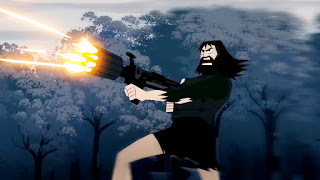 Overall, Samurai Jack season 5 episode 1 stayed true to the original series but with a much darker and mature theme. The computer animation grew more advanced while at the same time, not completely neglecting the original series' handwritten artwork. We can expect to see blood, shocking revelations, and much more as the series goes on. Ever since i became a fan of pro-wrestling, i have always loved staredowns between two wrestlers. I think many fans don't realize just how special staredowns are. Why do i love staredowns? Because staredowns are what create emotions and make a storyline feud all the more intense. Want to know one of the things that makes a match memorable? Staredowns. It's not the moves or the athleticism. Why is that? 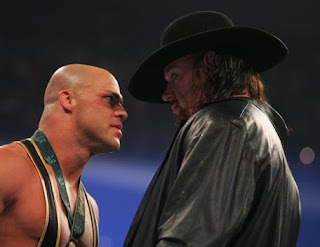 When wrestlers do staredowns, it gives the fans time to soak in all the emotions and fierce rivalry or bitter hatred the two wrestlers share for each other. Staredowns make feuds all the more believable when you think about each wrestler's skill level and history with the each other, the pain they caused each other, the intimate moments they shared with each other in the ring, their characters, what they've done, who they are, their fearlessness and recklessness, list goes on. Staredowns show that neither wrestler is willing to back down from a fight. Staredowns show that two rivaling or feuding wrestlers want to beat each other and that's what makes matches memorable. Staredowns are what makes me as a fan want to pay to see the show in person and watch how a storyline ends.